Through its many collaborations in Amsterdam and abroad, in the museum or outside its walls, Foam stays relevant within developments in photography and contemporary society. The projects that come about from these collaborations - often with partners such as artists, businesses, other non-profits or galleries – are fundamental for stimulating, presenting and identifying photography in new and surprising ways. 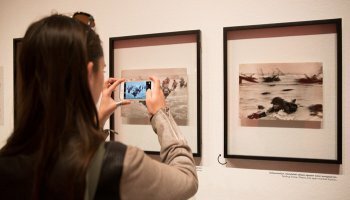 During the Foam Talent exhibition at Beaconsfield Gallery Vauxhall, London, Foam and Beaconsfield co-organise the educational programme Teen Tours, in collaboration with The Photographers' Gallery. These tours are given by four youngsters from London, who have prepared their own tours and content through an intensive training programme. The Teen Tours take place on 18 June 2017, the last day of the Foam Talent exhibition. Starting in 2017, Foam is taking part in the organisation of recommended, a biennial fellowship for three promising emerging photographers working in the artistic field. The fellowship is organised with Olympus, in cooperation with the Haus der Photographie / Deichtorhallen Hamburg, and the Fotografie Forum Frankfurt (FFF). Foam nominated Austrian photographer Thomas Albdorf (1982) and will be coaching him during the fellowship, after which his work will be exhibited at Foam in 2018. Foam is organising the New Perspectives programme, with which it is helping newcomers and people granted temporary residence to participate in society in Amsterdam in a good and constructive way. 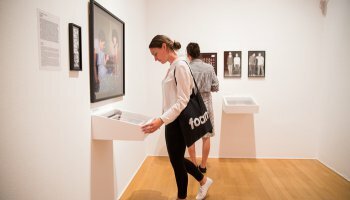 The project, which covers a range of workshops, tours, masterclasses and exchanges in and beyond the museum in Amsterdam, has the objective of using photography to stimulate creative encounters and language development. Amsterdam Vertelt is an initiative by Amsterdam’s public library (the OBA) and Foam Fotografiemuseum Amsterdam with the aim of stimulating new forms of social interaction in Amsterdam’s neighbourhoods. Guided by professional photographers and writers, over two years, residents from four Amsterdam neighbourhoods will work together on photography and stories. Amsterdam Vertelt brings participants into contact not only with art and culture, but also with their own creative talents and with each other. The Musea in Gebaren ('museum in sign language') project is an initiative by Foam and Wat Telt! to train young deaf and hearing-impaired people as museum instructors. In a six-week internal training programme, young participants were trained as ‘Deaf Museum Guides’. After completing their training guides are linked with participating museums where they can put their knowledge into practice as professional guides.